The Town of Chudleigh is unusual in that it is associated with two coats of arms, only one of which is an original. The unofficial crest was designed and drawn by Mr C Popham for local pottery man James Kelly in 1897, for use on his souvenir chinaware. The other are the arms of the ancient Chudleigh family. It is this latter armorial bearing comprising three lions rampant that has been displayed on the Chudleigh road signs, initially in the early 1980s and in more recent years used by the town council on their letterheads. The three lions design was also first used on the commemorative Beating of the Bounds mug in 1984, commissioned by Gwynneth Andrew of Hams in memory of her daughter Jennifer and appeared on the cover of Anthony Crockett's book A Chudleigh Chronicle, published the following year. The (unoffical) 1897 Town Arms created by Popham. 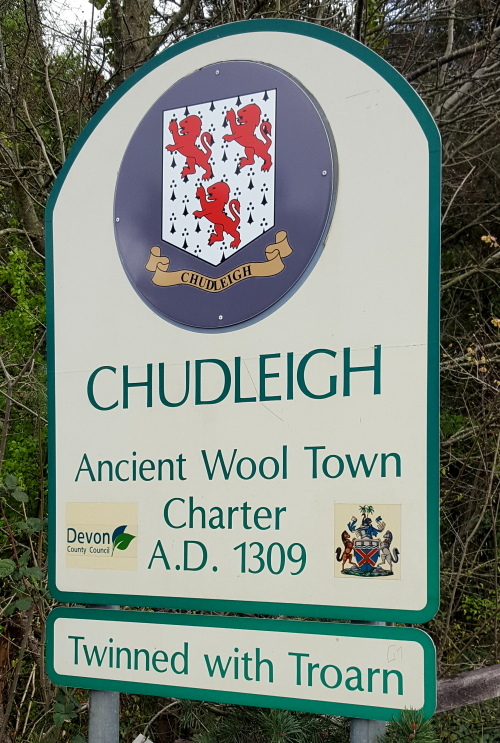 So, how is it that the arms of a family by the name of Chudleigh have come to be adopted by the town? The family of the name Chudleigh was an ancient one and is fully described by John Burke in his published work of 1838 entitled 'A Genealogical and Heraldic History of the Extinct and Dormant Baronetcies of England'. Their motto, not used by the town was Aut vincam, aut peribo. That book at pages 115 and 116 fully details the line of descent of the family from the early fourteenth century. In about the year 1320 John, son of John Chudleigh of Chudleigh received the manor of Ashton from Thomasine le Pruz, daughter of Richard. At that point the Chudleigh family settled at what later was called Place Barton in Ashton which was finally given up in 1745. About ten years before, Sir George Chudleigh, the 4th Bart. had begun to build the great mansion at Haldon which he did not see completed, dying in 1738. It was later acquired by the Palk family. This Sir George had three daughters only and the Chudleigh name was continued by his nephew, Sir Thomas Chudleigh, an officer in the army. He died unmarried at Aix-la-Chappelle in June 1741 and was buried at Chelsea on 12 July 1741. He was succeeded by his cousin Sir John Chudleigh of Chalmington, Dorset, a few miles north-west of Dorchester. He was killed at Ostend on 1 August 1745 and being unmarried at his death and having no issue, the baronetcy, created on 1 August 1622 became extinct. His sisters became his heirs at Chalmington which then passed to their nephew Hugh Chudleigh Haines Esq. who sold the estate of Chalmington in 1799 to William Bower, an alderman and banker of Dorchester. 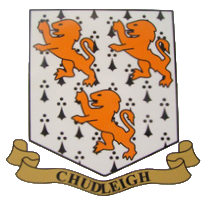 At this point there was no longer any male of the name Chudleigh who was entitled to bear the Chudleigh arms. 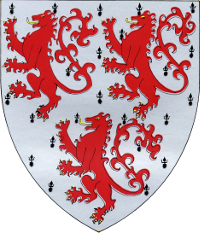 But how was it that these arms came to be associated with the town of Chudleigh? Little is known of the William Bower who acquired the Chudleigh family estates other than he was born in 1746 and had married Elizabeth Eliot and that he was buried in Dorchester in 1829. No doubt they had a number of offspring but one, a daughter is the key figure. This daughter, by the name of Elizabeth Bower, born about 1780 went on to marry William Isaac Scott of Plymouth (b1779) who had entered the Royal Navy in 1792. Their marriage actually took place at Lostwithiel, Cornwall on 15 November 1804. His career is touched upon by Crockett (1985) in his 'Chudleigh – A Chronicle'. Initially as a volunteer aboard HMS Windsor Castle he spent much of his early years in the West Indies on various ships. Six years on a frigate off the south cast of France followed and another period which spanned Trafalgar (1805) in the West Indies. A son of William Scott and Elizabeth was born at Chalmington House on 14 July 1807 and named William Bower Scott. From about the time of his son's birth his naval career was spent afloat almost continuously in the forces supporting Wellington's campaigns in Spain and Portugal. He was promoted to Captain in 1814 but saw no further active service. He retired in the rank of Vice-Admiral in 1846. In his long career only fifteen years were spent on full pay, the remainder on half-pay. William Isaac Scott and his wife, for some reason not established, had come to live in Chudleigh by 1834/35 where he acquired twenty acres of land at the top of Old Exeter Street that extended away from the town, through what much later became Highlands Park (originally Boyerhole Meadow) and across what is now the A38. It was here at the top of Old Exeter Street that his new home 'New House' was built. The home farm (more recently Rivendell and now a housing development) was called Newhouse Farm. His house was built on the site of what previously was the New Inn and in time the name of his house evolved into Newinnton Lodge. His wife Elizabeth died on 1 October 1840 and he on 12 January 1861. Their son, William Bower Scott, by now an established solicitor in Chudleigh and living in what is now the Grey House in Fore Street, placed a stained glass window in the north wall of the chancel to their memory. Vice-Admiral Sir William Bower Scott spent twenty-five years in Chudleigh during which time he was a very active member of the parish vestry committee. His son, William Bower Scott, a solicitor was also active in parish affairs and in 1866 gave a piece of ground, Boyerhole Meadow, for use as a reservoir as part of the new water supply scheme for the town. He stayed in Chudleigh and died here in May 1884. His wife died in December 1899. They are both buried in the churchyard, close to the boundary with Vicarage Lane and in view of their home on the opposite side of Fore Street. At this point it seemed that either of Vice Admiral Scott or his son would have presented the arms to the town and although the coincidence for this seems strong it does not seem to be the case. In 1948 the council were approached by a local pottery manufacturer to see if there was an official coat of arms for the town. Following some research the council concluded that there probably wasn't (Mid Devon Advertiser 10 July and 14 August 1948) and again in 1955 the town council carried out some research into whether Chudleigh had an official armorial bearing. The purpose of the research was that a badge of office was desired to be created and to feature the town arms upon it. The conclusion in 1955 was that all that was known for certain was the one that was designed for James Kelly in 1897. James Kelly's son, of the same name said that there was no copyright on their design and that the town council were welcome to adopt it and use it on the new badge of office. A gilt-edged medallion, with a wide blue ribbon was duly made and for the first time, on 2 February 1956, presented by the Vice-Chairman Miss D Bouchier-Wrey to the outgoing chairman Mr F Coram. The badge has been passed on to each successive chairman and is still today held by each chairman in succession. This crest, featuring the 'Seven Wise Men', two sheaves of corn and four acorns was, in 1964, painted on the north wall of the main hall by resident Mr Graham Lee and still remains there today. How was it then that the Chudleigh family arms came to be used by Chudleigh parish in very recent times? Perhaps Eddie Lee, town clerk 1948–1993 had something to do with it. On speaking to Graham Lee, Eddie's son it appears it was not through him. Graham is of the opinion that it was a member of the Amenity Society in the 1970s/80s that carried out research and came up with the extinct Chudleigh family information. If that was the case then the Scott family coming to Chudleigh was just a very strange coincidence. In the early 1980s the then vicar, Rev Christopher Pidsley, then a member of the parish council, suggested using an illustration of the town in silhouette on the town name boards at the entrances to the town but in the event the three lions were adopted. Also a councillor in the late 1970s and into the early 1980s was Col. Anthony Crockett of The Retreat in Old Exeter Street (since deceased). It would appear that it was he who realised that the Chudleigh family were long extinct and made contact with the College of Heralds for permission to use their crest. This permission must have been forthcoming as the town name board signs duly incorporated the three lions on their erection in early 1981, the arms were then used on the souvenir 'Bounds' mugs in 1984 and featured on the cover of Crockett's own Chudleigh book published in 1985. If this did happen then it would seem to have been either through the Amenity Society or Crockett personally as the Town Council have no evidence of any contact with the Heralds in their minutes. From 2009 the lions are used on the council letterheads (prior to their use an illustration of the Town Hall was used). The lions have recently returned to the new town signs, at either end of the town (B3344) having been replaced for a few years by 30 mph roundels. These were removed only a few years ago to be replaced by the lions when the 30mph zone was altered. On the entrance to the town from Ugbrooke and at Heathfieldlake the original 1981 town name boards with small lions crest are still in place. 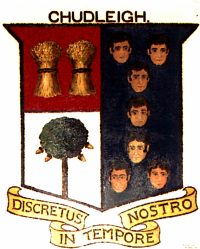 Christopher Vyvyan Popham [Genealogy Links], the man who painted the 'Seven Men' crest was of a Cornish family (Sithney near Helston) although he himself was born at Notting Hill, London. His father was Christopher Wallis Popham and his mother, Harriet. Not long after his birth the family had returned from London and at the 1851 census date the family were back in Sithney at Trevarno House. His father was described as Gentleman and JP. Popham's whereabouts on 1861 (19) and 1871 (29) census have yet to be traced but aged 39 in 1881 he was with his widowed mother and elder sister at 1 Alma Crescent in Falmouth. Barely a year later he was in Highweek near Newton Abbot having married Emily Polehampton. He was forty and she fifty-nine. In the mid-1890s he must have made the acquaintance of Mr James Kelly of 31 Fore Street, Chudleigh for by 1897 the 'Seven Men' crest was in existence and starting to appear on Kelly's chinaware. In the autumn of 1899 Christopher's wife Emily died, probably at Highweek and at the 1901 census date he was boarding at 21 Tracy Street in Plymouth and described as an artist/painter. About a year later he had come to Chudleigh and moved to a house in Clifford Street which he named 'Vyvyan'. He is in both the 1902 and 1906 directories. Nothing then is known of his life until his death was registered at Wandsworth in the June Quarter of 1917, he was then aged 75. Assuming that his wife was buried at Highweek in 1899 it may be that he was buried there with her.